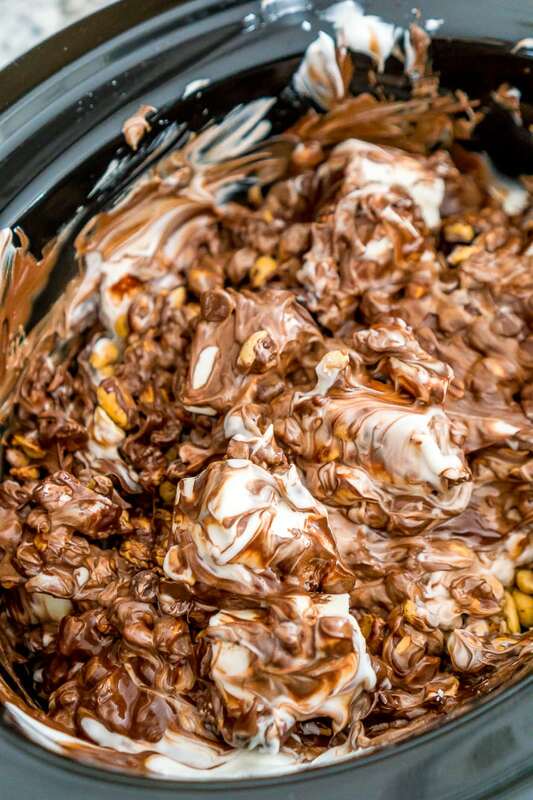 Crockpot Candy is loaded with peanuts, almond bark, and lots of chocolate and super easy to make in the slow cooker! Topped with some festive sprinkles, this pop-in-your-mouth treat is perfect for sharing during the holiday season. 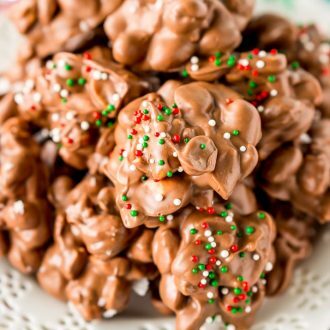 Attention chocolate fiends: this rich, crunchy Crockpot Candy Recipe will be your newest addiction! If you’re looking for something to fulfill your sweet tooth cravings in the cooler months, enjoy a handful of this decadent stuff! JUST TAKE ME TO THE CROCKPOT CANDY RECIPE ALREADY! If you’d rather skip my (very helpful, I think) tips and tricks, essential cooking info, and similar recipe ideas – and get straight to this deliciously easy Best Ever CROCKPOT CANDY Recipe – simply scroll to the bottom of the page where you can find the printable recipe card. These rich morsels are irresistibly munchy and perfect to put out at parties or get-togethers. You can even package some in cellophane bags or stack them in a Mason jar to give as hostess gifts, favors, or to use as stocking stuffers. Don’t forget the cute gift tags! 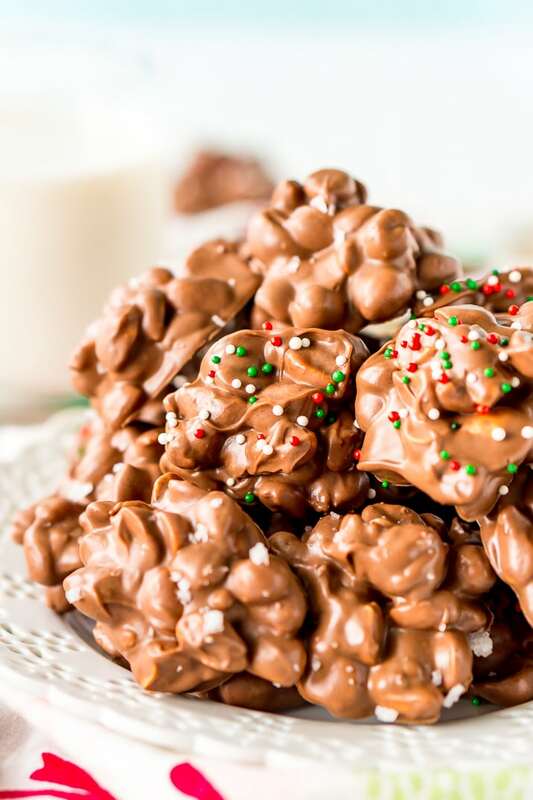 Pair this Crockpot Candy with coffee, hot chocolate, or champagne, and I promise you won’t regret it! To make it, just toss dry roasted peanuts, white almond bark, 60% chocolate, semi-sweet chocolate chips, and a pinch of salt into a crock pot or slow cooker… but don’t stir it just yet! Heat everything on low for an hour, then stir it together! Next, cook it for another 30 to 45 minutes until the chocolate and bark are completely melted and stir again. Scoop spoonfuls of the mixture onto a sheet of wax paper and top each with a pinch of sea salt or sprinkles, if desired, and let the candy harden. 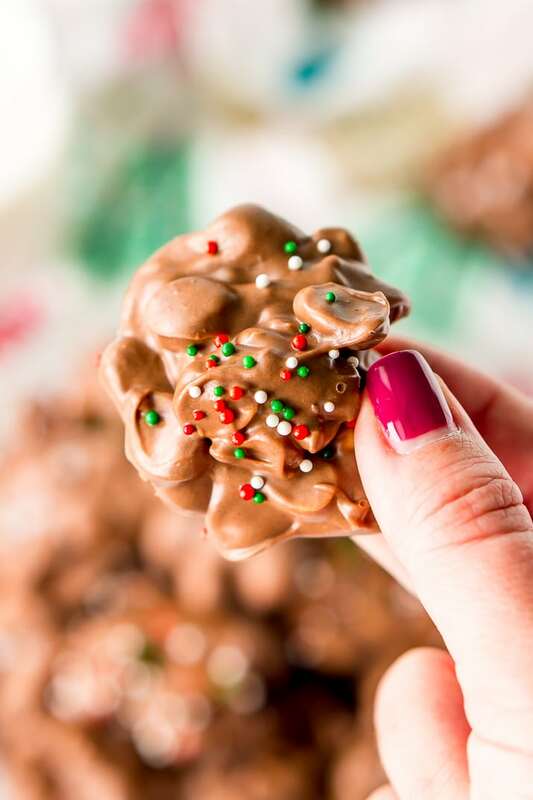 I like using round colored sprinkles during the holiday season to make this Slow Cooker Candy look extra festive (for instance, try orange and black for Halloween and green and red for Christmas!). 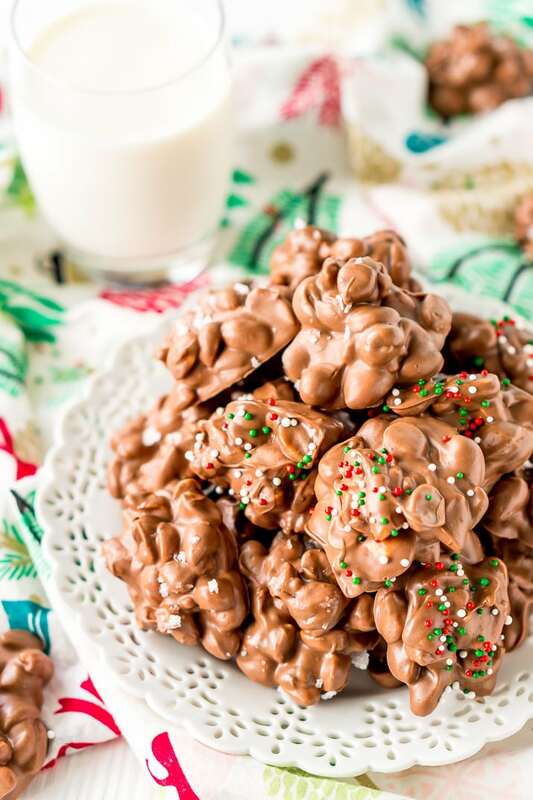 Let the peanut clusters cool and set. Then, get ready to enjoy and share a melt-in-your-mouth treat as an indulgent snack or a tasty dessert! Contrary to its name, almond bark doesn’t actually contain almonds or nuts of any kind. It is a vanilla flavored candy coating that is commonly used to coat nuts and other confections. You will find it in the baking aisle at your local grocer, but some only carry it seasonally. If you can’t find it, you can substitute it with an equal amount of white chocolate plus a tablespoon of vegetable shortening. How Long Does Crockpot Candy Last? This Crockpot Candy will last up to 2 to 3 weeks in an airtight container and stored in a cool, dark place. You can also freeze it, and it’ll stay good for up to 18 months … if you can resist it for that long! This simple recipe is a crowd-pleaser for adults and kids alike. Keep a batch of Crock Pot Candy on hand and you’ll have a seasonal treat ready for all your gatherings, from fall through winter. Add the peanuts to a 4 or 6-quart crockpot, top with the almond bark, chocolate, chocolate chips, and salt. Do not stir together. Cook on low for 1 hour. After 1 hour has passed stir the ingredients and cook on low for an addition 30 to 45 minutes and stir again. The chocolate and bark should be fully melted at this point, turn off the slow cooker. Place two long strips of wax paper on a clean and level surface. 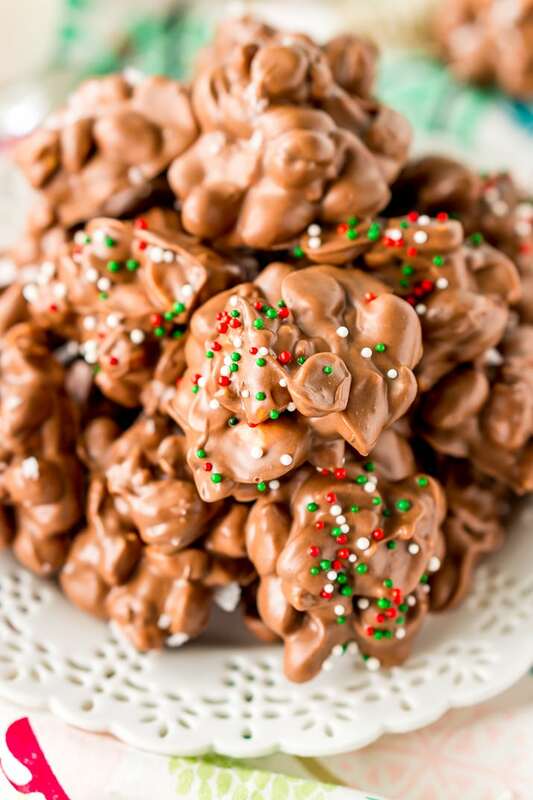 Use a tablespoon to scoop out mounds of the chocolate covered peanuts and place them an inch apart on the wax paper. Sprinkle them with sea salt and sprinkles if desired. Allow to fully set before enjoying or packaging up. This Crockpot Candy will last 2 to 3 weeks in an airtight container in a cool, dark place or up to 18 months in the freezer. Can these be frozen for later use? Hi Lisa, They absolutely can, my husband loves eating them frozen too! Aloha…I’m ready to make this recipe but have only 16 oz of Almond Bark. Will the recipe still work with this reduced amount? Hi Sue, I would cute the rest of the ingredient in half as well or substitute with candy melts or more chocolate. What if I just want White chocolates what do I do? Hi Michelle, I would still use the almond bar to keep the consistency right, then swap your chocolate with white chocolate. Keep an eye on it though as white chocolate melts different than regular chocolate and I wouldn’t want it to burn in you. Have you ever tried them with pretzels? Or any other kind of nuts? I made them for Christmas and everyone went crazy for them!! I’d like to make them for my daughters birthday party as favors. I’d love to do a chocolate covered pretzel style but can’t figure out how I’d do it! Hi Jessica, I have never made them with pretzels myself, but I know several have. I believe the loosely crush them first then put them in the crockpot. Peanut have also done Chex and Rice Krispies. And you can use any kind of nuts.